In this article, I’ll explain some of the mechanics of the solution, using fake data to “hide the innocent” but still offer some concrete details you can use in your own solutions. Recently I dealt with a large IoT dataset where data was flowing into a SQL Server database, fed from a REST API call that our developers were making to a third-party service. The results returned by those REST calls were in JSON format, and the developers chose to write this data to a table, exactly as received. Later, Business Intelligence was asked to build several SAP Business Object reports based on this data. That led to the conclusion we needed to transform the data into a SQL data store, since that was going to allow for consumption in SAP BO, merging with other SQL-based data as well. Here we’ve taken some data that would be sitting in JSON and combined it with other data in our SQL data warehouse (e.g. arrival and departure dates, where we might have looked these up using a key such as the tracking or device ID). We were dealing with SQL 2014 on-prem, so we didn’t have the ability to use native JSON parsing functionality which became available in SQL 2016. We did find a free, third-party JSON parser that’s implemented as a SQL user-defined function (UDF). This would have allowed our team who know SQL well to easily “join in place” raw data from our IoT feed with the other data – but I was concerned with performance and scalability. 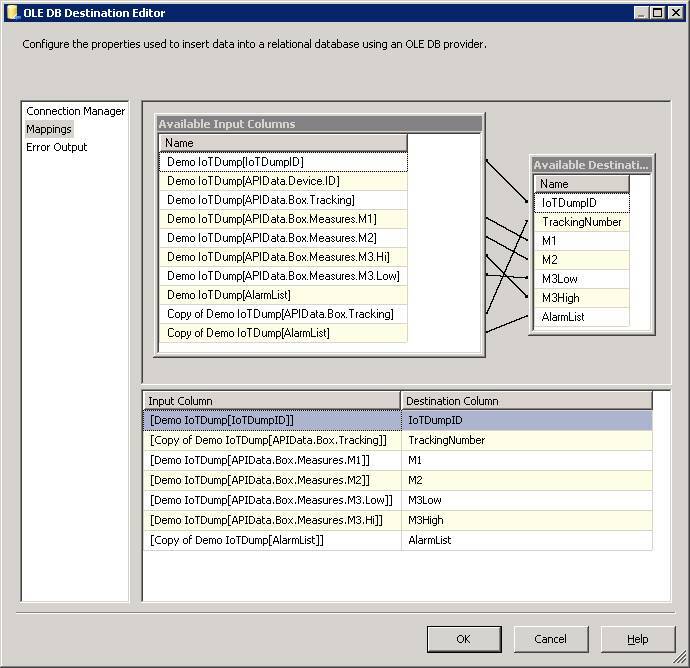 With SQL 2016, forethought has been given to offering good performing solutions that involve JSON, including the ability to create indexes against JSON “values.” However, this approach still doesn’t address advanced parsing, such as splitting arrays into multiple rows, or concatenating values into a list, and having these persisted in a high-performance manner. Here our IoTDumpID is retained from the source table, for traceability back to the row’s origins. Explicit fields for each tracked attribute can be strongly-typed and named in a meaningful way. If we wanted to call out alarm codes in a one-to-zero-one-or-many way, a child table would be warranted. However, in our case there was no indication of any value in alarm codes beyond a simple, concatenated list. Here we’re seeing Power BI offering a way to split JSON objects and arrays into columns. But it’s Power Query as used by Power BI that’s the key here; what we’d really like is a way to use it programmatically and include it in an ETL process. One way to do so is by using Analysis Services. As a SQL Server shop, we could have done this using on-prem SQL licensing, but we had no existing tabular AS instances configured. (Nor did we plan to: we were already using AAS.) Spinning up AAS instances is very easy – so friction is very low. 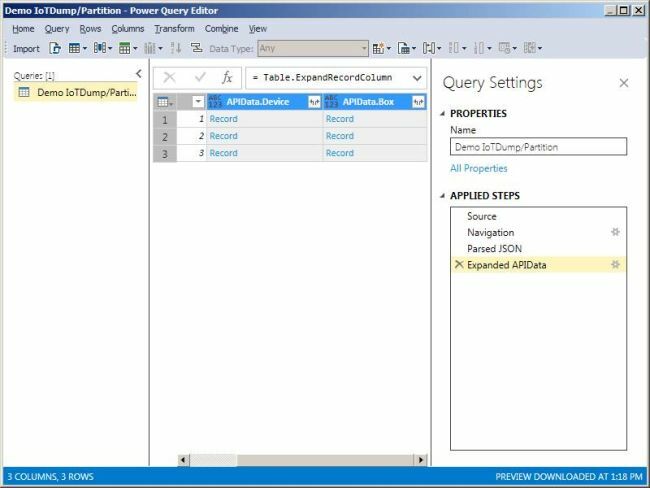 Power Query has been available to SSAS both in the on-prem and Azure-based (AAS) versions for a while. Notice that our landed JSON data is on-prem, so we’re using our installed On-Premises Data Gateway. The gateway is out-of-scope for this article, but the general principle is we can craft a solution that seems to work as if it’s on-prem: we can refer to server names that are on-prem, and then we deploy it to AAS – and it just keeps working! Since we’d only ever persist a subset of fields (the real JSON had about 100 attributes), if the business decided they wanted to include a field in the original JSON that was not being included in the shredded output, we’d have had to do a “retroactive load” of older data, potentially. Given the dataset size, this would eventually become a big, slow deal, having to run a UDF over millions of rows. Using a tabular model layer means we’d flatted every single field available, up-front. Our choice of putting a subset in a SQL table comes down to running a query against our tabular model (e.g. using DAX – a query that itself can be sophisticated, if needed). We’d need to cut SQL code to shred JSON, not using - oh say, a visual designer! At this point, we’re going off-road into hand-written M, but it is possible and emphasizes the “power” part of Power Query. Functionally, the only real difference from on-prem and AAS is your reference will be a URL that has a scheme of “asazure”. The key now is we’ve got a tabular model, connected to our data source, and it’ll be updated when the model is processed. This processing step will be worked into our larger solution, described next. In my example, the 4th and 5th rows came from my sample JSON above. Keep in mind, if we’d gone the UDF route, things wouldn’t have been nearly as easy, since it wasn’t as simple as extracting a new value from the JSON: we had to change the very granularity of the target data. With the change, our model now emits one or more rows for each “ID” value of our landing table. If we’d previously created say a primary key in our SQL representation of the data that used this ID value – we’d need to adjust that, expanding it to be a compound key (including the EventType). 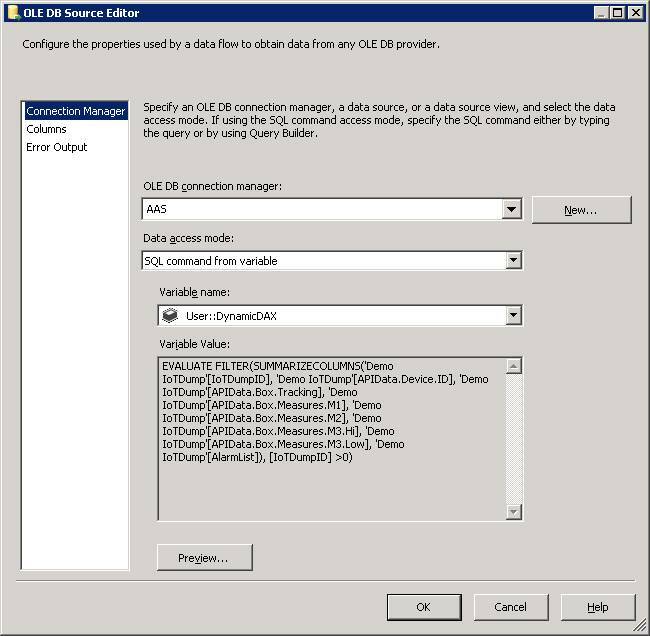 In the end, the overall solution has succeeded well in production: the SSIS package runs for about three minutes, on the hour, and data has been flowing reliably for reporting. Making the change for the new field was shockingly simple and well received. I may discuss related topics further, so stay tuned. 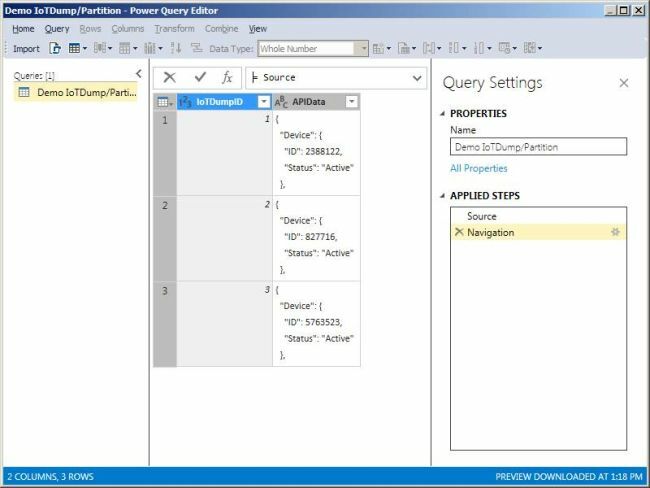 Also, there are other related technologies that attempt to do what we’ve done with Power Query here, and I’m interested in hearing about other approaches, too! Did I not explain something well, above? Leave a comment and I’ll try to clarify.